BattleBlock Theater will draw you in with its whimsically silly story and completely hook you with some fantastic platforming. While you can play this solo, I highly suggest grabbing a friend to share the laughs with you. Behemoth certainly had their work cut out for them here. With the runaway success of Castle Crashers from a few years back (and Alien Hominid doing well in its own right), BattleBlock Theater was going to have to be fantastic to live up to the hype. Five years later and countless roadblocks demolished, BattleBlock Theater is finally here. Ladies and gentlemen, I’m pleased to announce that it was worth the wait. The game starts off as you and 300 of your closest friends survive a shipwreck as the narrator (who may or may not be on Prozac) tells your story using puppets and an amount of enthusiasm that doesn’t seem humanly possible. In a concept that feels like Disney’s rendition of Running Man, you find yourself trapped in a prison run by cats who force you through horribly dangerous obstacle courses for their entertainment. All the while your best friend Hatty is seemingly possessed by a magic hat. The premise is completely ridiculous, but that seems to be Behemoth’s specialty. Everything about this game is over the top, but none of it feels out of place. The insane level designs, diabolical traps, the cat prison guards, and the colorful pallet that makes up the world, it all just combines expertly. The Narrator stands out as a hyperactive cynical voice that picks apart your every move and progresses the story. While he may use poop humor a bit too often for some players, the whimsical delivery of it was enough to keep me laughing. The gameplay itself is a bit hard to describe. 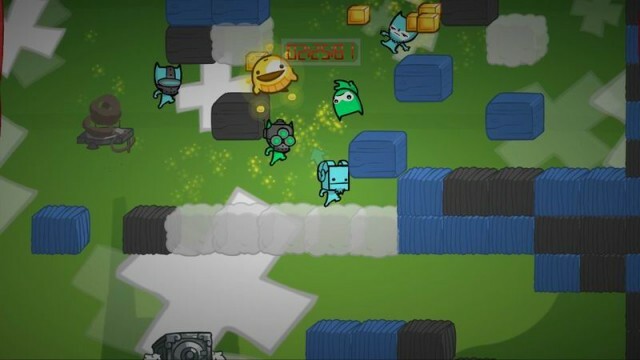 At its core, BattleBlock Theater is a platforming game, but it borrows a few elements from brawlers to spice up the mix. To be perfectly frank, the game falls short on the brawling element. While the weapons add a bit of variety, they’re not the most reliable. They either do too little damage or offer an instant kill. Sure, you can punch your opponent to toss him around, but it becomes an issue of mashing the button rather than using any sort of strategy. 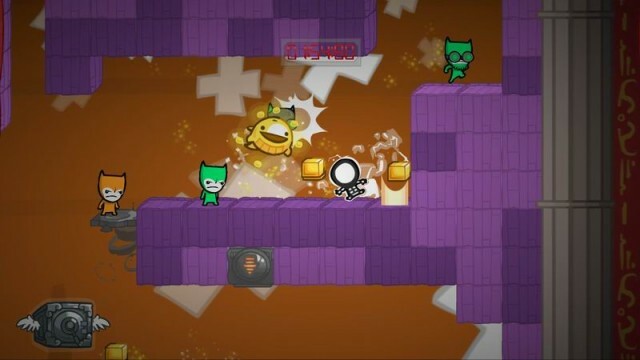 However, as a puzzle platformer, BattleBlock is absolutely astounding. The controls feel tight, the jumping is fluid, and movement carries the perfect amount of weight. There’s no tutorial to speak of, but the game does a fantastic job of teaching you on the go. There are a few instances where you’ll swear you should have made that jump as you fall to your death, but for the most part the game does exactly what you tell it to do. The levels are set up in a way that encourages taking risks and pushing your limits. While you only need to collect three gems to unlock the exit, there are a total of 7 waiting to be found, as well as a ball of yarn. Finding the initial three is usually a pretty straightforward affair, however, you’re going to have to go out on a limb for the rest. Hidden passage ways, exploiting of enemies, and complex jumps become the norm fairly early on in the game. 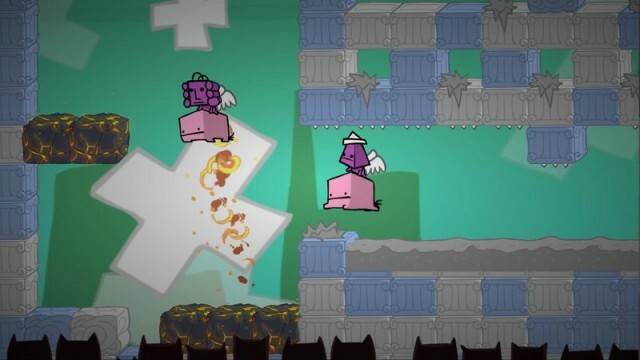 While BattleBlock Theater is nowhere near as brutal as say, Super Meat Boy, it definitely will test your patience. In each of the worlds (which have been split up into “acts”) you’ll find a gift shop waiting for you to cash in your gems and yarn. Five balls of yarn will be enough to convince the cats to slip you a new weapon, and with every ten gems, you unlock a new head for your character. There is an absolute plethora of heads to be unlocked, and while they’re strictly cosmetic, it is kind of fun to see what’s going to pop up next. I would have liked to see a proper shop set up with the yarn so I could choose what item I unlocked, but there’s something to be said for the (seemingly) random way I found weapons. While you can play through the entire campaign on your own and have a great experience, BattleBlock Theatre absolutely shines in multiplayer. I invited a friend over under the guise of helping me with this review (while secretly hoping she’d supply the wine this time), and when I fired up the campaign I was shocked to find out it was completely revamped for multiplayer. Simple jumps before had been replaced by areas where one player has to throw their buddy across the trap. It’s a seemingly small thing, but the entire campaign was brand new playing it with a friend. The online Arena mode could become a go-to source of entertainment for many gamers. There are eight different game modes ranging from an outright brawl to capture the flag on horseback. My personal favorite so far is arguably the most straight-forward. Challenge sets up a head to head time trial race between teams, and really gives you a chance to show off the skills you learned in the campaign. If you start getting tired of the set levels, BattleBlock Theater offers a fairly robust level editor. It’s not going to reinvent the wheel as far as editors go, but the community is already sinking their teeth into it and coming up with some cool ideas. Don’t expect it to rival the LittleBigPlanet community, but it should be enough to keep the game fresh. BattleBlock Theater is easily going to be my go-to game for when I’ve got a few friends over. It’s one of those titles that can win over anybody, and depending on how the community embraces the level creator, I could easily imagine this being the platformer version of Mario Kart. If you are the type of gamer who simply can’t stand platformers, then you may want to sit this one out, but for everyone else I highly suggest picking this one up. You won’t regret it.